this and the watercolour crayons. So I played around a bit. my ferret." Zoey stops yelping in distress. 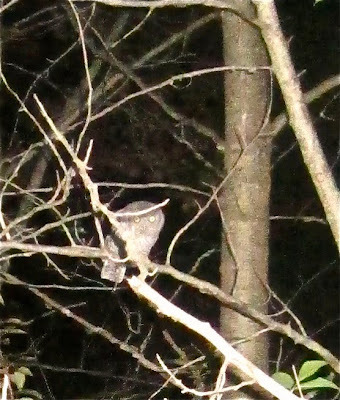 three baby owls in the trees beside us. we are seeing baby owls. How amazing! Labels: small portrait sketch. watercolour crayons on bond. Toronto. Canada. In spite of the madness, you were suppose to be on that walk. 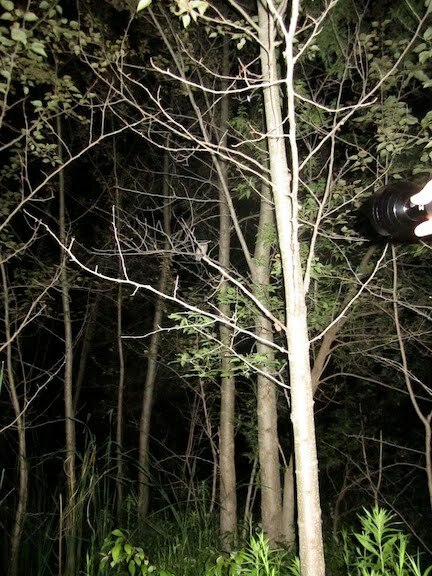 Thank you for photographing those miraculous baby owls. How odd. Kind of like a menacing Alice in Wonderland moment. Ferrets in doll strollers, pitbulls, babies and baby owls. All in an evening walk. You just needed a cherry pie floating by to make the evening perfectly weird..lol. I'm glad your dog's okay, Barbara--I know how frightening that is: my little Itchy was attacked by a pit bull and required stitches in several places. Mostly it was just terrifying. 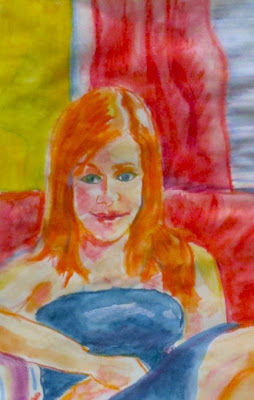 Love all the hot colors in your crayon drawing, and its directness: in the application of color and the sitter's frank gaze. You must have some great reference photos collected! In the immortal words of Anna Rosanna Dana, "It's aways somethin! Some days are like that I guess. But leave it to you guys to find something wonderful in the midst of pit bulls and ferrets. I like Kims take on this, "menacing Alice in Wonderland". What a hoot! a great description about the menacing wonderland! ha ha. The watercolour crayon sketch is fresh and vibrant, what a good medium for a sketching. the baby owls so so sweet.